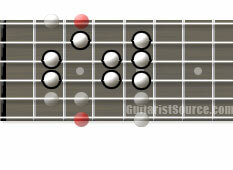 The Natural Minor Scale is played by starting and stopping on the 6th note of a Major scale. The natural minor scale is also known as the Aeolian Mode or Relative Minor scale. The Notes of the G Major Scale showing its Relative Minor scale, the E Natural Minor Scale. The Formula for a Natural Minor Scale: whole step, half step, whole step, whole step, half step, whole step, whole step OR by lowering the 3rd, 6th, and 7th notes of the major scale a half step.